A new book of poems by Mary Jo Salter merits an enthusiastic welcome. An accomplished formal poet, Salter’s skillfully deft touch enables her to tackle serious and/or sensitive subjects with a lightness that belies the psychological precision of her approach. Poems in The Surveyors tumble through (and mix and match) subject matters as disparate as the dissolution of a marriage of many years, ruminations on parents and parenting, details of a new romance, thoughts on the discovery of the Dead Sea scrolls, the poet’s various travels in Europe—and that is just by way of a mini-sampler. Salter’s approach to poetry is at once erudite and spontaneous, serious and lighthearted. “The Profane Piano Tuner,” for example, who rains “a litany of abuses . . .” on the recalcitrant keys of her daughter’s piano, is nevertheless hired year after year so that her daughter can continue to play a “. . . Chopin prelude like an angel . . .” on the freshly and expertly tuned instrument. This poem provides an excellent example of Salter’s sophisticated and often experimental use of form. Tercets alternate with couplets, the stanzas end-rhymed in the following pattern: aaa, bb, ccc, dd, etc. Given these seemingly rigid patterning and rhyming constraints, the poem itself nonetheless has a distinctly casual and unforced feel due in part to Salter’s expertise in enjambment and syntax. It is somewhat difficult to remember that Salter’s journey carries with it an impasto of loss. “Vierge Ouvrante” addresses a triptych of the Virgin, about which Salter observes, “She knows the future is past mending./Why look to her for an opening/for some other ending?/” The implication here, of course, is that the past, too, is beyond mending, as the past—and future—always are. 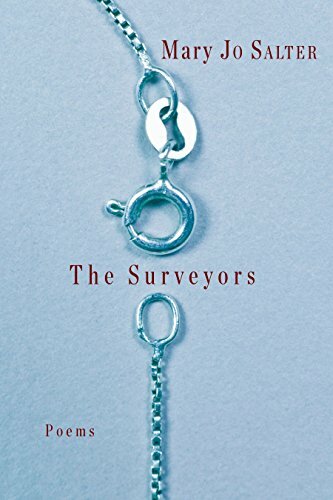 Salter’s title poem, “The Surveyors,” is an extended (12-sonnet) crown in which the poet answers a letter from Matthew Yeager inquiring as to whether she has ever written a poem entitled “The Surveyors.” Yeager reports having dreamed that he had read such a poem. Salter’s response is to confess to “. . . being haunted by . . .” the question. “All we can say so far/is that we suffer/for nothing./” writes Salter in “So Far.” “We suffer because/suffering’s there./” And because it is there, these smoothly lyrical, sometimes almost rollicking, poems slow from time to time and darken, like clouds overtaking the afternoon sun after a long spell of bright weather. And here is the magic of these poems. Salter indeed embraces her life—and life in general—with an almost romantic love, not so much in spite of life’s pain, loss, and separation, but in no small part because of it. The very fact that a subnarrative of personal history is present in these poems sometimes renders the thread of the poems a bit hard to follow. It helps to bear in mind that, rather than a formal story line, the characteristic theme in this collection is a kind of emotional connectivity, and Salter’s emotional thread is most often both apt and accurate. In these poems she blends past, present, and future with her characteristically lyrical touch, resulting in “geometries that bend/to a vanishing point . . .” (“Lo Sposalizio”). In the end, Salter successfully synthesizes her personal present tense with the wider present around her, her fears and disappointments, her joys and her enthusiasms, becoming art, “Art as target. Art as grid/where secret combatants are hidden./” (“An Afghan Carpet”). Salter’s “secret combatants” populate an eclectic landscape of grief and discovery, of loss and happiness, of longing coupled sometimes with melancholy but rarely with regret. These are the poems of a woman passionately living her life. And they are unforgettable.